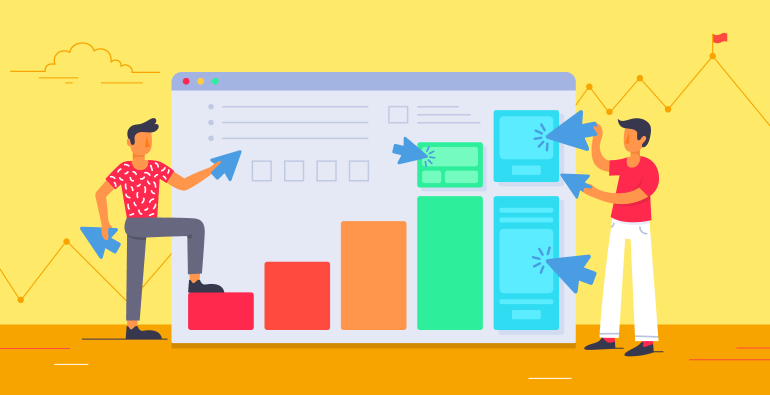 Welcome to the web’s most comprehensive guide on display ads click-through rate (CTR) that will help you to optimize your display advertising campaigns, get clicks and convert! We will supply you with all the information you need about display ads and their click-through rates (CTR) so that you can begin to run PPC display campaigns on your own, starting today. 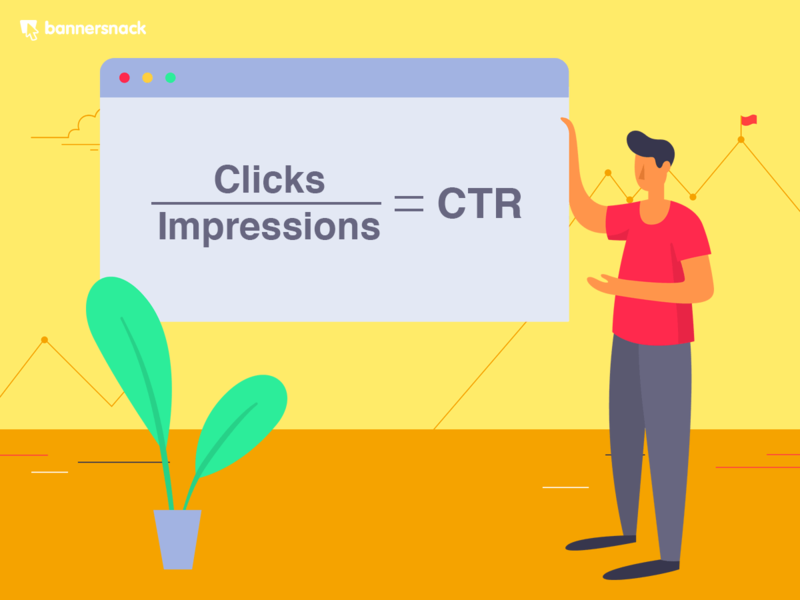 What does click-through rate mean for display ads. How is CTR calculated (the CTR formula). What is the average CTR – CTR statistics. What is a good CTR for display ads. How to increase CTR – a list of actionable tips. Why you need to increase your CTR to reduce CPC. CTR versus conversion rate (CVR). 1. What is the click-through rate (CTR)? In online advertising, the click-through rate is a term that defines the number of people who click on an ad. CTR shows how many people who see an ad actually click on it. 2. How is CTR calculated? Let’s take an example: you had 7 clicks and 100 impressions. Thus, your CTR would be 7%. 3. Average CTR by statistics. 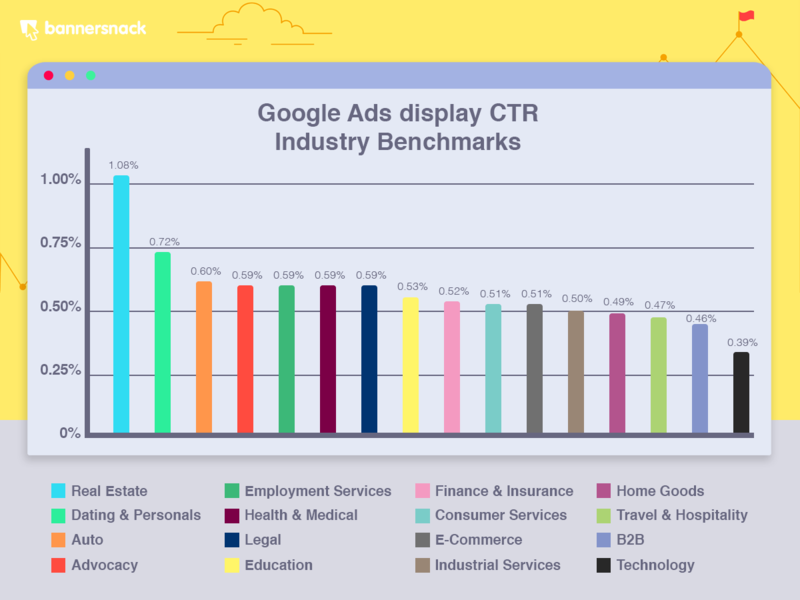 According to Wordstream, the average click-through rate for display ads in Google Ads is 0.47%. That means 47 people out of 10000 click on a display ad. Though it may seem a small number of people, the CTR for display has actually increased from what it used to be a few years ago. So, this is good news for you to start advertising your business. However, as we look into specific industries, CTRs vary greatly. For example, the technology industry has a CTR of 0.84 %, while travel & hospitality counts 0.47% and dating ads 0.52%. Have a look at the graphic below to see how things are doing in your industry. CTRs vary also by platform. That’s because Facebook users are different than Google users and Twitter users. Also, each platform works with different ad formats and ad locations. 4. What is a good click-through rate for display ads? Considering that 0.47% is the average CTR for display ads in Google, we can say that a good CTR would be between 0.5% – 1%. Now, if you’re running display ads in many countries, you will see a variety of CTRs. People in different countries will resonate in a distinct way with your ads and brand. Your job is to keep an eye on the analytics reports, asses the results and come up with strategies to increase your CTR. Find some helpful tips to increase your CTR here below. 5. 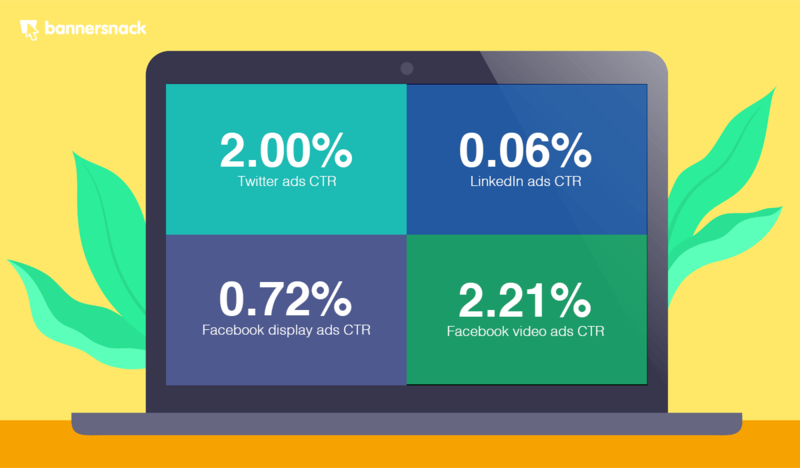 How to increase the average CTR for display ads. A. Reconsider your sales strategy. Sometimes, CTRs may have nothing to do with ad design or channel placement, but with the promotional sales strategy! This means that you have to reconsider your campaign starting with its backbone. If you’re selling detergents and you’re offering a 5% discount for each product, people may never click your ad, cause it’s an insignificant price cut. But if you offer one free product for every bought item, you may see a rise in CTR. 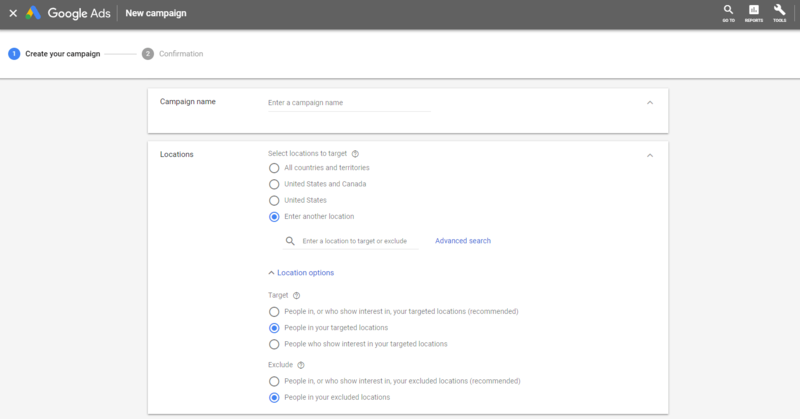 Google Ads offers remarketing as an audience targeting option in their campaigns settings. Considering the Google Display Network reaches 92% of all the internet users (and that Google stores data about these people), remarketing is a highly successful method of targeting and converting audiences. Although remarketing uses complex machine learning technology, the process is pretty simple: this method allows companies to retarget users who have visited their website, app, YouTube channel or are part of a customer list. Google’s remarketing tool allows incredible specific lists segmentation so that you can target people who viewed particular pages of your website. For example, if you have an e-commerce website selling baby supplies, you can retarget users who have visited only your baby skincare product pages. people who have visited specific websites (for example your competitors’ websites) or are looking for specific keywords (like your competitor’s name). This is called custom affinity. Or people who are actively searching for specific keywords in Google. This is called custom intent. Using Google’s incredible audience segmentation tools you increase your chances to get more clicks and convert. Your display ads won’t be shown randomly to everyone browsing the net, but to specific people, who are highly likely to be interested in your product. One of the basic rules of online campaigns is to set precise geolocation. If you’re running a local business, such as a restaurant or grocery store, you don’t need to target people outside of your town, so why waste money on ads that will be shown to people thousands of miles away? Instead, make sure you select your area and add a 10-30 miles radius. Also, be careful when you choose the location settings. 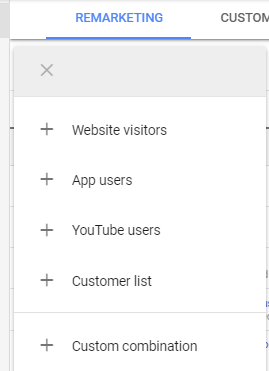 Make sure you select the “People in your targeted locations” option, otherwise if you go with Google’s recommended “People in, or who show interest in your targeted locations” you’ll get clicks (and pay for them) from people located in other countries who will never ever visit your restaurant/store. When setting up your display campaigns, go through the “Topics” section. This section allows you to refine your groups of audience, by selecting topics from a wide range of topics. Targeting – By choosing “targeting”, you simply have to choose your preferred topics from a preset list of topics. Your ads will then be shown to people who have performed certain searches related to a subject. Observation – Use this option if you’re not sure whether a topic you chose is good for your campaign (relevant for your target audience) or not. This option does not restrict your audience targeting, it only collects information about the performance of the topics you choose. Data is reported for ads that meet criteria selected for both observations and targeting. You can then use this information to re-adjust your campaigns, using other topics. The websites you choose for your ads determine their CTR. Some platforms have deals with niche websites or media publishers which allows better targeting. For example, if you have a pet shop, you won’t get many clicks if you run your ad on an online newspaper’s website. But you could attract more visitors and sales if you place your ad on a vegan recipes online magazine. Vegans are more likely to have pets and thus they’re highly likely to be interested in pet food and supplies. 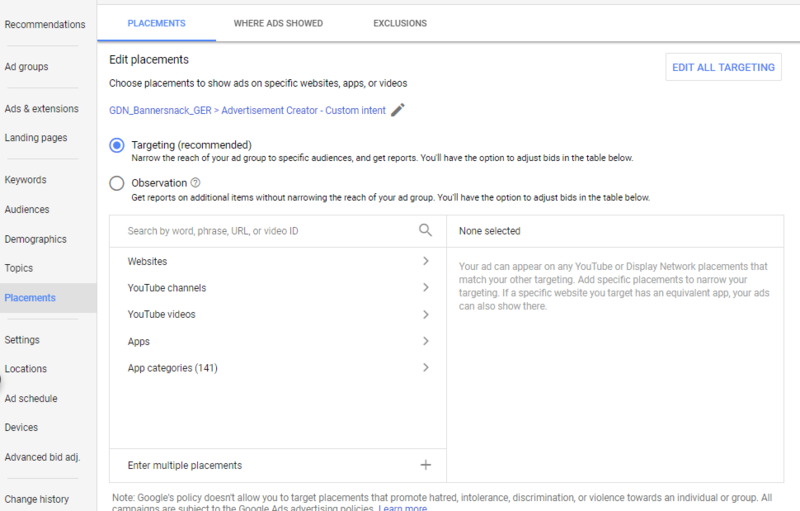 With Google Ads you can choose specific websites you’d like to target, YouTube channels, YouTube videos, apps, and app categories. Another trick to increase your ads’ CTR is to limit how many times these ads are shown to the same user. 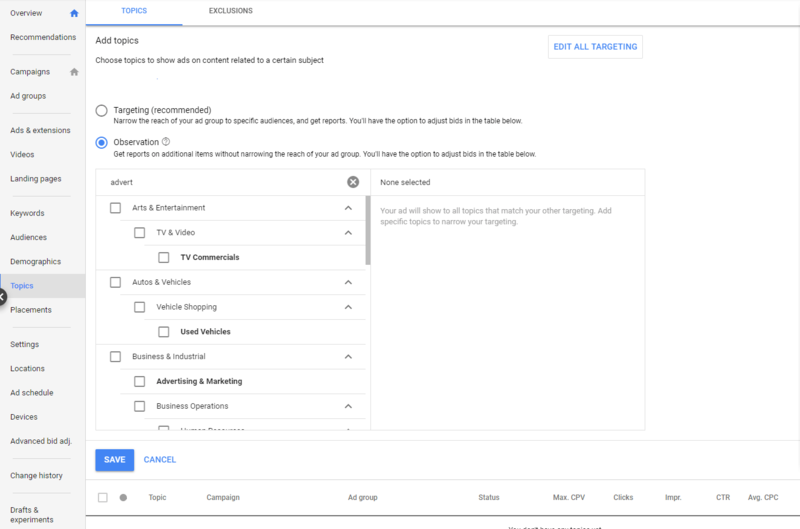 Go to Google Ads’ Settings -> Frequency Capping and choose how many times you’d like users to see your ads per day, week or month. You don’t want to spend money showing the same ad to the same person who is not interested in your ad. 1. The design – If your CTR is low, the design could be one of the culprits. Try changing the design of your ads, the layout, and colors. Play with the color palettes and test various combinations to see which one performs best. Use brief calls to action: maximum 4-5 words. Choose a clickable color. Make sure to create contrast against the background color. The shape. There are a variety of shapes that could go well as a button, but you must find a shape that matches your overall design, concept and brand personality. The color. Some colors are more attention-grabbing than others. Red, for example, is a sure bet that people will notice your button and message. Contrastingly, grey is a discreet color that can pass unnoticed. The location of the button. Depending on your layout architecture, you have several options to place your button. Generally, the button should follow your ad’s headline and invite people to perform an action. Thus, it should either be under your headline or in the right side of your text (because we read from left to right). One simple way of identifying the best location for your buttons is to use a heatmap. 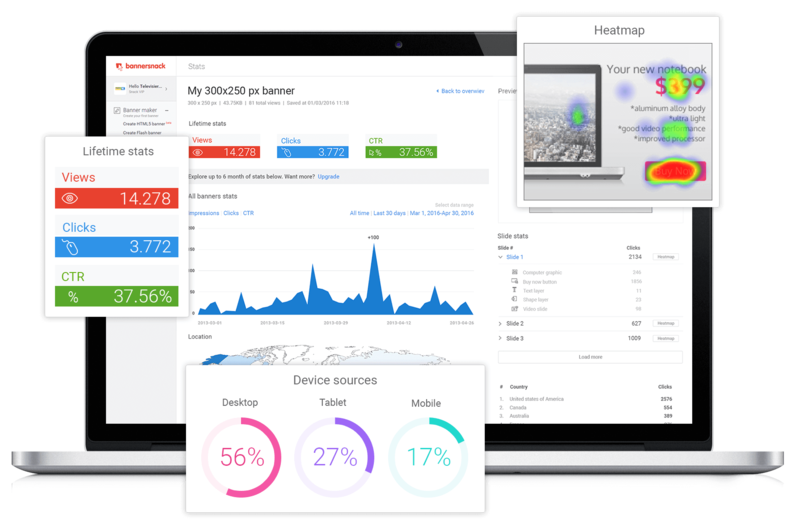 Bannersnack’s analytics and reporting tool use heatmaps to track the performance of banner ads, and offers valuable information on how to re-adjust banners and come up with a more clickable design. I. Create sets of banners to fit all the standard formats. Generally, a display campaign employs a set of banners of various formats and sizes that suit different websites, platforms, Social Media channels, and devices. If you thought making a banner would be enough to promote your business out there, it’s not. You need to create a set of banners in order to reach multiple websites and devices. Luckily, things are not so complicated if you use Bannersnack as your design help tool. 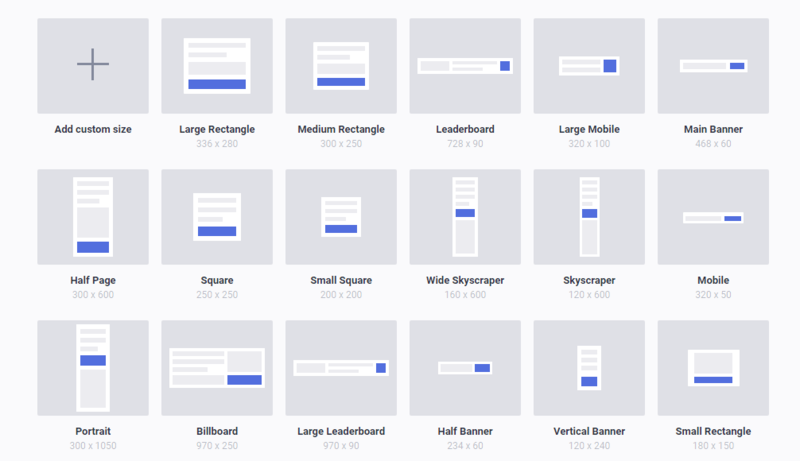 Bannersnack’s revolutionary Banner Generator tool allows you to create sets of banners (starting from 20+) in an instant. What’s great about Banner Generator is that once you choose your preferred sizes and formats, you can create multiple banners simultaneously. It’s amazing, but it’s true! Check out the videos! Or, you can create responsive HTML5 ads. “Responsive ads automatically adjust their size, appearance, and format to fit available ad spaces. So a single responsive ad may appear as a small text ad in one place and a large image ad in another. 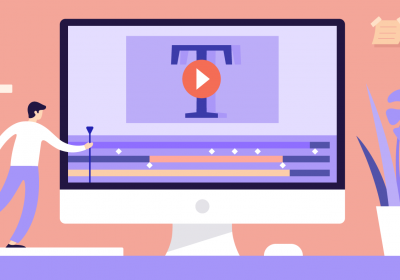 To create a responsive display ad, simply upload your assets (images, headlines, logos, and descriptions), and Google will automatically generate ads to be shown on the Google Display Network. Google automatically optimizes your ads combinations, based on machine learning models. The possibility to upload more brand assets (logos, images, and headlines). You save a lot of time, which in turn you can use to manage your campaign. However, if you want to have truly amazing banner ads, it is better to create sets of banners. Although Google automatically generates responsive ads to fit all devices, their ads are not really what one would call “outstanding ads”. 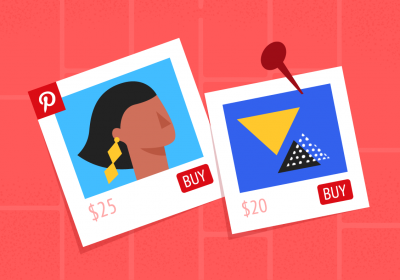 So, it’s up to you to decide what type of ads you want to use for your campaigns. Another way to stand out online and increase your CTR is to us use dynamic HTML5 banners. Studies show that HTML5 ads have higher CTRs than static ads. That’s because they are more appealing and engaging. With HTML5 banners you have more time to tell your brand’s story, showcase your products and talk about its benefits. The HTML5 technology may seem complicated, and it really is if you’re using traditional design tools and code. But with Bannersnack, creating HTML5 banners is actually a piece of cake: you just have to drag and drop objects (pictures, graphic elements, texts) and add animation effects, code-free. Bannersnack was built to enable people like you to create spectacular banner ads without any prior design or code knowledge. Its easy-to-use editor can be learned and mastered in a matter of minutes. While some marketing specialists agree that we should think our advertising campaigns for mobile first, because of Google’s recent Mobile First update, we believe mobile CTRs are not really showing the effectiveness of a campaign. In other words, mobile CTR does not reflect or gets even close to the real conversion rate. Why? Well, most mobile ads go into apps. “While on apps, people are engaged in various actions and click on ads for various reasons, some of which may have nothing to do with genuine interest towards that brand. For example, some users click on ads to get rid of them, because they somehow intrude or interfere in their experience. Thus, these clicks do not mirror a user’s interest toward an ad, therefore they are not valuable. So, stick to desktop for the time being and then expand your campaigns to other devices after you have gained some experience. CTR directly influences cost-per-click (CPC) and ultimately, your return on investment (ROI). The higher the click-through rate is, the lower the cost per click. Today’s average CPC for display ads is $0.63. Although the CTR has increased over the years, CPC has seen a small rise (it used to be 0.50 a few years ago), which is great for marketers. CPC also varies from one industry to another and from one location to another. The dating industry has the most expensive CPC ($1.49), with e-commerce ($0.86) and consumer services ($0.81) following after. Tracking your campaign’s CTR is definitely a must. The CTR informs you of the number of people that are clicking your ad. However, what this metric doesn’t tell you is how many sales a specific ad generates. To measure sales, you need to track the conversion rate (CVR). According to Wordstream, the average conversion rate for display ads in Google Ads is 0.77%. conversion rates are higher in the case of remarketing campaigns. So, it’s very important to clearly define your campaign objective and to create specific ads for all the stages of the sales funnel. All right, enough about CTR and let’s move on to setting up the campaign. Remember to check on this metric periodically, asses your performance and adjust your campaign accordingly. Whether you change the design, call to action or audience targeting, make sure you’re considering your users’ feedback. After all, it’s them you want to attract to your website! I think there is a typo here, should’nt it be 1.000 and not 10.000 ? I know it’s a small number of people and that it may seem unbelievable, but this is the fact. 0.47% really means 47 people click on an ad out of 10.000 who viewed it. 47 people of 1.000 would be 4.7%.